Hey gang. It’s been ages since I reviewed anything so I thought I’d throw up a quickie while I wait around for the Trump/Clinton debate to start. I haven’t been feeling very motivated to blog lately so I’ve selected a figure which should make for a short and sweet write-up. I’ve told you before about Boss Fight Studio’s Vitruvian HACKS toyline, a project they funded via kickstarter and that I supported. Series One consists of figures based in Greek mythology, primarily Greek warriors and gorgons. There are also a number of customizable blank figures available which allow you to create wholly original characters. The fourth and final category of figures included in series one is skeletons. 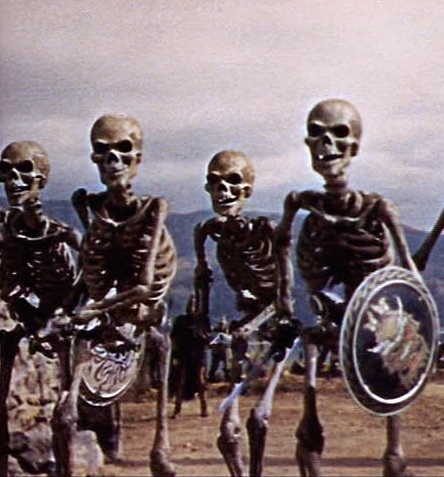 You can use the skeletons as set dressing or as undead warriors a la “Jason and the Argonauts”. Since I bought the all-in kickstarter package I received skeletons in a variety of colors: white, black, yellow, translucent purple, and hot pink. I believe the pink one was a kickstarter exclusive so if you like this one you’re out of luck unless you buy one on the secondary market. The others are currently available to purchase on BFS’s website along with a new grey version. It’s neat to have an exclusive but honestly the pink is my least favorite of the bunch. The sculpt is the same on all the skeletons regardless of the color and it’s fantastic. It is truly impressive that the ladies and gentlemen over at BFS were able to capture this much detail in such a small figure and still load it up with articulation. No corners were cut in designing this figure. There are spaces between all the ribs in the ribcage and there are gaps between the fibula and tibia and the ulna and radius. He’s articulated at the ankles, hips, waist, ribs, shoulders, elbows, wrists, neck, jaw and he has double jointed knees. The movable jaw is super cool and really makes a skeleton go from docile to manic. 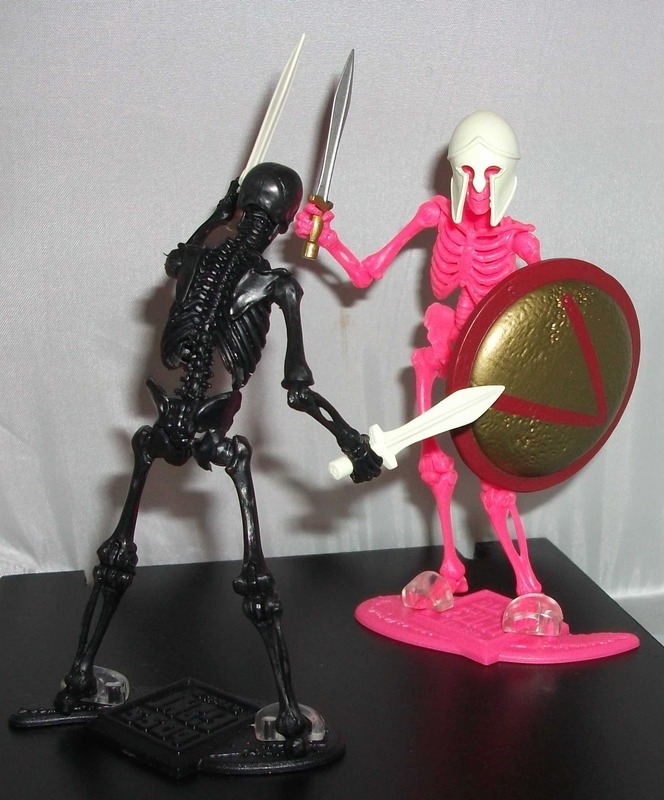 These skeleton figures are awesome and they can be used to enhance any 3 3/4″ action figure display. Up the stakes on a G.I. Joe battlefield or recreate Uncle Owen and Aunt Beru’s demise on Tatooine. If I have one negative thing to point out about these figures it’s the lack of paint. I was so excited to receive these skeletons when they first arrived in the mail a few months ago that I didn’t give a second thought to the fact that they had no paint apps; bones are white anyway so who needs paint. But then my Mythic Legions Skeletons from Four Horsemen Studios arrived. The paint work on those 6″ figures was so rad that it made the Hacks skeletons seem a little boring by comparison. That’s not entirely fair though as BFS’s skeletons are smaller, much more affordable, and intended for customizing. 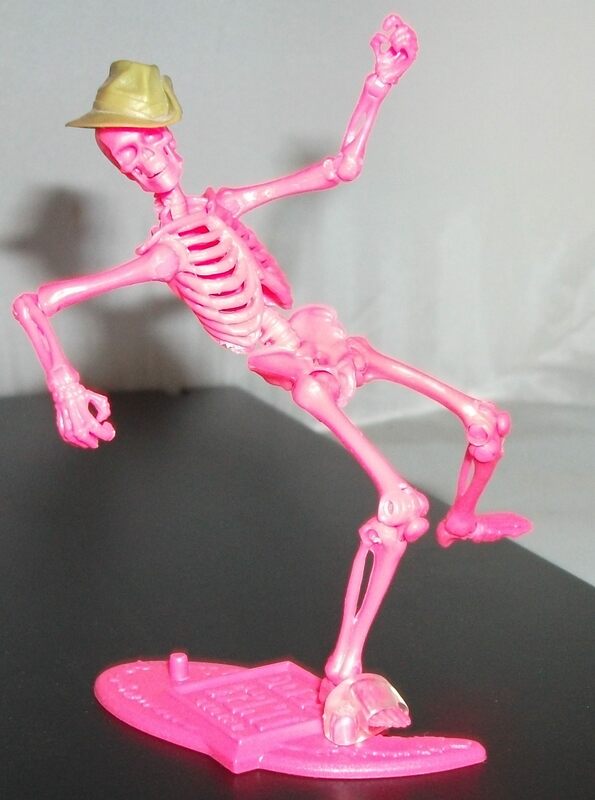 A Vitruvian Hacks skeleton in another color would easily rate a 9 or a 10 but in pink I give this guy a 7 out of 10.